In the summer of 1922, Robert Shannon, a Marine chaplain and a young American hero of the Great War, lands in Ireland. He still suffers from shell shock, and his mentor hopes that a journey Robert had always wanted to make to find his family roots along the banks of the River Shannon will restore his equilibrium and his vocation. But there is more to the story- On his return from the war, Robert had witnessed startling corruption in the Archdiocese of Boston. He has been sent to Ireland to secure his silence permanently. As Robert faces the dangers of a strife-torn Ireland roiling in civil war, the nation's myths and people, its beliefs and traditions, unfurl healingly before him. And the River Shannon gives comfort to the young man who is inspired by the words of his mentor- Find your soul and you'll live. 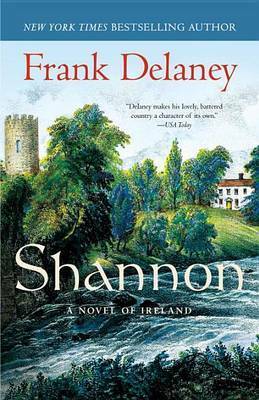 Frank Delaney is the author of the New York Times bestselling novel Ireland as well as Tipperary and Simple Courage- A True Story of Peril on the Sea. A former judge for the Man Booker Prize, Delaney enjoyed a prominent career in BBC broadcasting before becoming a full-time writer. Born in Tipperary, Ireland, he now lives in New York City and Connecticut. i>From the Hardcover edition.